This historically significant essay was one of the first attempts in modern times to examine homosexuality, putting it in a medical, historical and legal context, and to propose that civil rights should be extended to gay people. 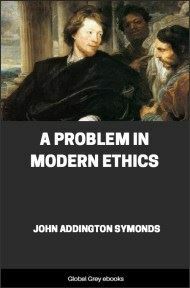 Along with Edward Carpenter and Walt Whitman, Symonds was one of the pioneers of gay rights and spirituality. 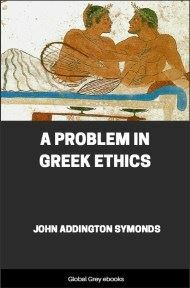 Symonds later wrote a companion essay to this, A Problem in Greek Ethics, which drew on his extensive classical knowledge to examine homosexuality in ancient Greece. SINCE this enquiry is limited to actual conditions of contemporary life, we need not discuss the various ways in which the phenomenon of sexual inversion has been practically treated by races with whose habits and religions we have no affinity. On the other hand, it is of the highest importance to obtain a correct conception of the steps whereby the Christian nations, separating themselves from ancient paganism, introduced a new and stringent morality into their opinion on this topic, and enforced their ethical views by legal prohibitions of a very formidable kind. Without prejudging or prejudicing this new morality, now almost universally regarded as a great advance upon the ethics of the earlier pagan world, we must observe that it arose when science was non-existent, when the study of humanity had not emerged from the cradle, and when theology was in the ascendant. We have therefore to expect from it no delicate distinctions, no anthropological investigations, no psychological analysis, and no spirit of toleration. It simply decreed that what had hitherto been viewed as immorality at worst should henceforth be classed among crimes against God, nature, humanity, the state. Opening the Bible, we find severe penalties attached to sexual inversion by the Mosaic law, in the interests of population and in harmony with the Jewish theory of abominations. 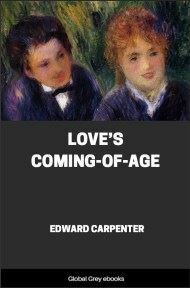 The lesson is driven home by the legend of two cities, Sodom and Gomorrah, overwhelmed with fire because of their addiction to abnormal sexual indulgences. Here the vindices flamina, of the Roman code appear for the first time-the stake and the flames, which mediæval legislation appointed for offenders of this sort. St. Paul, penetrated with Hebrew ethics, denounced the corruption of the Gentiles in these words: "For this cause God gave them up into vile affections: for even their women did change the natural use into that which is against nature: and likewise also the men, leaving the natural use of the woman, burned in their lust one toward another; men with men working that which is unseemly, and receiving in themselves that recompence of their error which was meet." Christ uttered no opinion upon what we now call sexual inversion. Neither light nor leading comes from Him, except such as may be indirectly derived from his treatment of the woman taken in adultery. When the Empire adopted Christianity, it had therefore the traditions of the Mosaic, law and the first chapter of the Epistle to the Romans to guide its legislators on this topic. The Emperors felt obscurely that the main pulses of human energy were slackening; population all tended to dwindle; the territory of the empire shrank slowly year by year before their eyes. As the depositaries of a higher religion and a nobler morality, they felt it their duty to stamp out pagan customs, and to unfurl the banner of social purity. The corruption of the Roman cities had become abominable. The laziness and cowardice of Roman citizens threatened the commonwealth with ruin. To repress sexual appetites was not the ruler's object. It was only too apparent that these natural desires no longer prompted the people to sufficient procreation or fertility. The brood begotten upon Roman soil was inadequate to cope with the inrushing tide of barbarians. Wisdom lay in at tempting to rehabilitate marriage, the family domestic life, Meanwhile a certain vice ran riot through society, a vice for which Jehovah had rained fire and brimstone upon Sodom, a vice which the Mosaic code punished with death, a vice threatened by St. Paul with that recompence of their error which was meet." Justinian, in 538 A.D., seems to have been terrified by famines, earthquakes and pestilences. He saw, or professed to see, in these visitations the avenging hand of Jehovah, the "recompence which was meet" mysteriously prophesied by St. Paul. Thereupon he fulminated his edict against unnatural sinners, whereby they were condemned to torments and the supreme penalty of death. The preamble to his famous Novella 77 sets forth the principles on which it has been framed: "Lest as the result of these impious acts whole cities should perish together with their inhabitants; for we are taught by Holy Scripture, to wit that through these acts cities have perished with the men in them . . . . It is on account of such crimes that famines and earthquakes take place, and also pestilences." Before Justinian, both Constantine and Theodosius passed laws against sexual inversion, committing the offenders to "avenging flames." But these statutes were not rigidly enforced, and modern opinion on the subject may be said to flow from Justinian's legislation. Opinion, in matters of custom and manners, always follows. law. 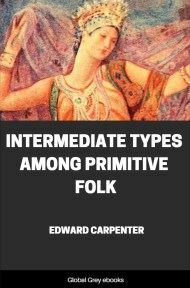 Though Imperial edicts could not eradicate a passion which is inherent in human nature, they had the effect of stereotyping extreme punishments in all the codes of Christian nations, and of creating a permanent social antipathy.